The authors are performing detailed reanalysis of the data for the above paper and will submit the revised paper to the journal as soon as possible, likely before the end of September. I wonder how IPCC will handle this. Will Gergis et al be given the Wahl exemption? An issue has been identified in the processing of the data used in Watts et al. 2012 that was placed online for review…. The authors are performing detailed reanalysis of the data for the Watts et al. 2012 paper and will submit a revised paper to a journal as soon as possible, and barring any new issues discovered, that will likely happen before the end of September. This entry was written by Stephen McIntyre, posted on Aug 2, 2012 at 12:17 PM, filed under Uncategorized and tagged gergis, neukom, watts. Bookmark the permalink. Follow any comments here with the RSS feed for this post. Both comments and trackbacks are currently closed. I expect they will just use the original submitted date, whenever it was back in 2011. I think the mess that Gergis et al found themselves in was considerably worse than most commenters realized. Using the methodology they chose originally, most of the proxies were rejected when the calculations were done correctly, which pretty much eliminated any hope of using the paper as the landmark meta-analysis for the southern hemisphere. Meanwhile, using a different methodology would require arguing against the specific claims they made in their own paper! At this point, any approach they take will smack strongly of starting with the conclusion and working backwards. I predict the final AR5 will summarize the SH proxy studies and reach the same conclusion without a Gergis style meta-analysis to cite. – Exactly, yet is there any doubt about what their findings will be? I don’t think Louise understands the nature of curiosity. Had we not kept looking, we would not have discovered Leroy 2010 and the subsequent endorsement of his station siting standards by the World Meteorological Organization. If siting wasn’t an issue, NOAA’s NCDC would not have spent millions of dollars to create the Climate Reference Network in 2002, and finish it in 2008. The CRN adopts Leroy 1999 station siting standards. If all that mattered were better electronics, they would have placed a new CRN station in the parking lot at Arizona State’s Atmospheric Sciences Department, instead of placing it 11 miles west of the UHI of Tucson at the Sonora Desert Museum. If siting didn’t matter, would we have a WMO standard for it? If siting didn’t matter, would NOAA have gone around quietly closing the most obscenely sited stations like Marysville, CA and the Tucson parking lot station? Pielke Sr. updates and says Watts et al 2012 will still be a game changer, no matter which side the results come down on. What’s really cool is that thanks to the criticism, we’ve already learned something new about the TOBS adjustment that may itself result in a new paper. Isn’t Louise the least bit curious to find out about any of this, or should we squelch curiosity because we shouldn’t think things “should be there”? If scientists didn’t think the Higgs Boson “should be there” they wouldn’t have spent billions on a new Large Hadron Collider. My results, shared with co-authors, whatever they end up being in the final analysis, won’t be anything close to the importance of that, but I reserve the right to have the same curiosity they do. C’mon, that’s a cheap shot…every study begins with a hypothesis. The problem arises when the data is sufficiently tortured or filtered to prove the hypothesis. Gergis et al wrote a terribly flawed paper, denied that it was flawed, withdrew it from publication, claimed they discovered the flaw, denied that it had been withdrawn and then proceeded to treat poorly the folks that helped them discover the error. 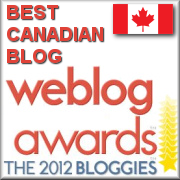 Now they are engaged in a behind closed doors rewrite and a public smearing of our host on this blog. The distrust that M Skaggs exhibited is well earned. On the other hand you may dislike or even distrust Anthony Watts. So be it. But there is no way you can claim that the Watts et al paper will be poorly considered and poorly vetted in advance of publication. That assumes of course that the paper merits publication at some point. The fact is that Watts has put his work out there for the world to critique and he is publicly responding to the criticisms and concerns. Isn’t that better than doing a hasty rewrite behind closed doors with the expectation of immediate consideration by a journal? I mean Gergis et al was withdrawn on the basis of informal peer review from the blogosphere. And rightly so, the paper was apparently terribly flawed. That the authors are expressing confidence it can be resubmitted to the Journal of Climate by the end of September is concerning even if it isn’t a surprise. Gergis et al wrote a terribly flawed paper, denied that it was flawed, withdrew it from publication, claimed they discovered the flaw, denied that it had been withdrawn and then proceeded to treat poorly the folks that helped them discover the error. Now they are engaged in a behind closed doors rewrite and a public smearing of our host on this blog. A world of difference between Gergis and Watts. But a fair comparison by Steve. Louise, are you prepared for a U-turn, if that’s what the data signifies? Yes, I am. I’m a veteran of many U-turns, some of them pretty big. But my survey of the evidence so far indicates it to be a “vanishingly minuscule” likelihood. Well Luoise, the physics of radiative retention is what lead to the discovery of CO2’s ability to slow the escape of photons from our atmosphere. Being in the heating industry, I can positively say the Anthony’s remark about the physics of heat sinks is dead on. If we know that certain products’ mass, composition and colour have the ability to retain more units of energy (in heating, this is why water can be used to effeciently move energy in very small pipes, while air needs large ducts to move the same amount of energy), yet when studying the sighting of accredited thermometers, and the data that is distributed from such, we see that a unit sited surrounded by asphalt is essentially giving the same readings as one sited in a grass field, then yes, we know that the laws of physics are being somehow broken. So would you not be curious as to why? Ano Zero doubt at all, that the usual suspects will give gergis a pass, whilst trashing Watts. Anthony is dead right. Curiosity is the driver. When we’re constantly told stuff which, from our limited perspectives, seems implausible, we get curious. Sometimes, curiosity kills the cat. Sometimes, lots of cats collectively chew little holes in the thesis that ‘experts’ expect us to believe. …or you could do a Mann and ignore EVERYTHING and continue along your merry path pretending nothing was wrong. Steve, thanks for the update. Gergis et al was splashed across every MSM outlet in the country when it came out – ‘conclusive proof’ etc. Subsequent events have had almost zero coverage – not least, I guess, because it makes all the wide-eyed, uncritical regurgitators of press releases (aka ‘science’ writers) look foolish. As for Watts et al, and Louise’s comment, I must be missing something. How is putting a piece of research out for public review and comment, and acknowledging that some suggestions/critiques have been helpful, a sign of Machiavellian cunning so as to enable a ‘u-turn’? Perhaps Louise has been hanging around with the wrong kind of people for too long. Lack of MSM coverage of the withdrawal is more likely because all the “wide-eyed, uncritical regurgitators of press releases (aka ‘science’ writers)” didn’t get a press release about it, and actually doing “investigative journalism” went out with Watergate. So they probably simply have no idea that there was a problem. It would be a delightful surprise of some science journo reading this site could respond, but it seems unlikely. This would not have anything to do with the New Zealand court’s hopefully going to trash NIWA’S southern temp record’s. I assume they all use each other’s data maybe the domino affect is already starting. Gergis et al will have to solve a major problem. Which temperature database will be valid for calibration of proxies? If they are working in Australia using BOM data, they have a choice of rawish data, more homogenised data of the HQN series and quite recent data from the ACORN-SAT release of a few months ago. It is agreed that some of the stations that are rather different in each of these 3 versions are not applicable to the proxies being considered, but there need to be an assurance that the logic of each successive data string alteration is incorporated into the proxy work and the reasons given as to why. If you leave the official BOM series aside, there is a private MAN set and there is a later set under construction drawing on the Anthony Watts et al 2012 paper in prep.If a gridded global database is used, then all ye who enter here abandon hope. The major problem is that some of the proxies would almost be turned on their heads by the magnitude of the changes between versions. Like 1 deg C or more for 40 successive years in one BOM instance. A further large problem is that some of the dendro work is hard to link to past climate stations that are in close proximity, at similar altitude & geography, and with little missing data & site shifts for the tree sites. If I were a referee, I’d wipe out the Tasmanian work for these reasons. Perhaps this is the answer, because then Australia can be dropped off the list and we won’t need to be criticised. What is the expression for “Around Australia, but not in Australia”? Should the title be changed to “Circum-Australian” or similar? Just for clarity, is the issue raised by Zeke Hausfather and Steve Mosher associated with TOBS or is there another issue being referred to as “An issue has been identified in the processing of the data used in Watts et al. 2012”? FWIW the procedural difference is that Gergis was actually submitted to a journal and review was underway. Watts was at best a rough draft and there are serious issues of whether all of the listed co-authors had seen it in final form when it was posted. Steve: Gergis et al had been accepted by Journal of CLimate. So can you explain the current status of Gergis? Is it withdrawn, accepted but about to be revised, or what? I thought Gergis et al had passed peer review and was accepted for publication. Yes, I thought it was accepted for publication, and upon such acceptance, I thought it then proceeds from being a “manuscript” to being officially a “paper”. However, it seems after the problems the editor reverted to calling it a manuscript, which gives a different impression. Withdrawn before publication means that it is will not be published. The key here is whether it was published. Eli thinks it likely that the editor will treat a new version of the manuscript as a resubmission with substantial revisions and send it out again for review. Where it gets dicey is if something is published on line before appearing in printed form and then withdrawn (don’t even know if that can be done, imagine it depends on the journal and the publisher). Does it go down the shaft or what? Librarians may have strong opinions on this. On May 17, 2012 they asserted it was “published today in the Journal of Climate”, and I listened to the 30 min. online press conference conducted by Gergis, Karoly, and Phipps on that day (May 17) without detecting the slightest hint that anything about the study was still pending or still in review. If they did not believe their own Univ. of Melbourne PR or the announcement which brought listeners to that online media event, they gave no hint. Perhaps they are merely reckless with language and “published today” to them means “currently under review for potential future publication” but one could get no hint of that from any of their public words and behaviors May 17 – June 4, 2012. It was only when problems were identified at CA that we suddenly saw this language of “on hold” whatever that means. Why do some people have so much trouble using the word “published” for this study which was announced as “published” and which has since been “withdrawn”?? Contemporaneous announcements of May 16-17, 2012, including from the U. of Melbourne as well as via the online press conference held by Gergis, Karoly, and Phipps said repeatedly the study had been “published”…. it was only once they had to backtrack that the pretense of ongoing “review” and then the study “on hold” (meaningless phrase) came into play. Let’s see some honesty and transparency about the Gergis et al (2012) paper, please. Since even as it stood the study claimed a difference of only 0.09C between 12th century and current high temps, with a margin of error twice that…. I used 3 methods which were: RCS (Regional Curve Standardization) using the entire TRW series as the region, and the Spline and Modified Negative Exponential methods which are applied to individual trees. In order to standardize the results all the trees had to have data for the 1940-1980 time period that was used as a baseline. The results of all individual trees was sent directly from R to 3 separate pdf files where graph of the chronology for each tree is recorded. All these data and including the urls for linking to the NOAA repository data used and the R code are in form that could be emailed to any interested party. I found some large differences in chronologies from tree to tree even within the same series and more with regards to amplitude than overall structure. What I thought would be of greatest interest here is showing the results of a bootstrap analysis I made using all the trees in the NotGergis TRW series that fit the criteria listed above. I used a lowess function on the bootstrapped results to make graphs better show the resulting series and 95% CIs. In the link below I show four graphs where I used all three methods with all trees and the RCS method with trees older than 150 years. The results show a feature with which I am becoming very familiar with many temperature proxies I have observed and that is a series that meanders up and down with no sudden upward trend at the end. It certainly does not show what Gergis showed – but it should be remembered that I am not including coral proxies here, I did not preselect nor did I use the unavailable chronology method applied in Gergis. All I am saying is that my results cry out for Gergis to show how their methods would change these results. Great work Kenneth. I’ll take you up on your kind offer wrt code and such. Steve or moderator could a note be emailed to Kenneth with my email contact? I have done some work with the Gergis proxies (on the shelf until September) and would appreciate your “Non-Gergis” collection to hopefully give some perspective on the total candidate proxy pool. Kenneth, did you ask Melvin and/or Gergis for a digital version of the Melvin algorithm that was sent to Gergis? Yes, I emailed Melvin a few weeks ago and have not received a response. The paper describing the iterative RCS method stated that the algorithm code would be available at Melvin’s website. It was not there last I checked. Kenneth, why don’t you send Melvin an FOI asking for what he sent Gergis and what was undertaken to be available in the paper? It doesn’t look like he plans to answer you. I am going to attempt another route to getting the information but not FOI at this point. Steve: FOI makes them answer. I actually had good success with FOI in 2008 and 2009 under similar circumstances. The only one where it was a fight was CRUtem (and David Holland’s request for IPCC review comments.) I think that you may be surprised. SteveM, I made a second request to Thomas Melvin and he has replied with an offer to send the Fortran code and comments so that I can code it in R. Melvin said that he had replied earlier to my first email. He indicated that the procedure is being upgraded and parts of it were not ready for publication. The program evidently has to make a decision with each iteration between options such as using a modified negative exponential or straight line model and Melvin thinks this would be a complicated program in R.
I can provide the code/comments here when I receive it for those who might be interested and more skilled than I in either running the program as is or converting it to R. Melvin indicated that he is working with Ed Cook in putting the signal free approach into ARSTAN. I might check with Ed Cook on the ARSTAN release with the signal free approach. Your interest should be in the program as sent to Gergis and applied in the paper. If the program is subsequently improved, that’s fine but irrelevant to Gergis. SteveM, he is sending the unimproved version to me. “…. I’m not saying you should use these, but they might do better than those in GHCN. be able to use what you already have. sure sounds like making up an intricate “recipe” of what list of proxies one likes for their outcomes with the whole recon., rather than taking all available proxies that meet certain minimum criteria one sets BEFORE looking at any of them…. i.e., once you get into all this recipe work with testing each proxy against the various “ensembles” of proxies there may be too much danger of confirmation bias, creating the study outcome desired, etc. If you do not see any rules or criteria presented by the person making the selections beyond that the selections improve the end result you know full well the person is horribly naive in the ways of statistics. That must be the case here. Of course, that makes the process honest but wrong. A more devious approach would be to use the same exercise and then being aware of the statistics involved go back and fit some selection criteria that would select for what the exercise did using the end result only. I have seen this occur with people modeling investment strategies. It usually happens when the person thinks they are fairly certain of the final result and that they only need to confirm it with some data. I should be clearer that the NotGergis results that I showed in my post above has not in any way been weighted for spatial distribution or numbers of trees used at a particular location and thus my purpose was not to obtain a Australasian average but rather an average and CIs for about 1000 trees from this region that were not preselected. I may in the near future do the same treatment as I have in the preceding post using the averages for each TRW series and note the locations of the TRW series. I also failed to note in my post above that Gergis used a model with PCA regression (PCR method) to further treat the data for final presentation. In contrast I wanted my results to be derived as simply and straightforward as I judged possible and still present a general picture. So your results are for 32 sites comprising about 1000 trees? Isn’t RCS usually done site by site, rather than for a whole region at once? Do you see an advantage to doing it this way? Why do your CI’s open up so much at the left end? Less data or less agreement among the trees? I do see an upturn at the right end of your series (later 20c), albeit perhaps not significant given your CIs. But before attributing this to temperature I’d want to account for the effect of CO2 on growth. RCS is “detrended” based on all the regional data used to produce a growth curve, but in the end for each series you obtain a detrended series for each tree or tree sample that is averaged to obtain a chronology for the entire series. In the case of using a spline of modified negative exponential on each tree in a tree series you end with the same as in the RCS and need to obtain an average for the entire series. Anyway you can obtain individual tree data for bootstrapping. I am in the process of using each series as a chronology and doing bootstrap on that data. The comparison might be instructive. The bootstrap results, the way I did them, are going to be affected by the amount of tree data available for a given time period. Actually if you had only one tree for a time period the CIs would not differ from the mean since you would have only one random selection for that period. There would be some variation in the RCS because the other randomly selected data in other periods are going to affect that period. used purported CO2 fertilization to replace some TRW data from his reconstruction where the proxy gave an indication of too much response to temperature and then too little. He indicated that the CO2 fertilizer had enhanced growth and then reached a “saturation” level. Maybe in this vein it would be better merely to wave at that issue and then replace the offending data with data of your choice. I guess the R in RCS stands for Regional… Doh! I’d trust a parametric Student t CIs over bootstrap — if each tree has its own s.d. about the mean, this can be handled with panel se’s as in my CIs for Loehle and McC (2008), http://www.econ.ohio-state.edu/jhm/AGW/Loehle/ . If you compute a mean with only one observation, you have zero DOF, and an infinite Student CI, even though the one observation fits the mean exactly. I’d just add CO2 as an explanatory variable to any regression that relates TRW or MXD to temperature. If using Luterbacher’s 2002 PCA approach as in Gergis, I’d first separate proxies by type — TRW, MXD, ice core d18O, ice core accumulation, coral 18O, coral Sr/Ca, etc., and compute a small number (1?) of PC’s for each. For this purpose, include all available proxies, since the noisy ones that don’t correlate with anything will just end up in the discarded PCs. Then test if the lead PCs are collectively significant, and then check which categories are insignificant. For this purpose, include CO2 if TRW or MXD PCs are present. If insignificant PCs are dropped, there is still a data selection issue, but that can be adjusted for, as can sign flipping. It’s true that MBH99 alluded to CO2 and Milankovitch trends, but then they just bodged the HS shaft before 1400 with the trend from an unrelated series to make it look more like what they wanted to see. No actual CO2 numbers (or Milankovitch numbers) went into this bodge. Search Mannkovitch bodge in Google or CA. Not only do MBH99 not actually use any CO2 numbers, but the chart they show of CO2 to motivate this bodge is truncated way back so as to hide most of its incline! Kenneth’s understated style may cause readers new to CA to miss the dry humor behind this remark. As he noted recently at Lucia’s Blackboard, the climate science community accepts “replacing offending data with data of your choice” when presenting new Hockey Stick paleotemperature reconstructions in high-impact peer-reviewed journals. If the corrections were as simple as Gergis indicated in her email to co-authors and data providers, surely the revised paper would have been re-submitted by end of July as planned. It seems that the co-authors are coming up against the seriousness of the problems discussed here at CA, else why would they miss the IPCC’s deadline for AR5?? About the process leading up to peer review and publishing of a scientific paper … there has got to be a better way to have these papers properly audited! What has been happening with the Gergis paper and the Watts paper, releasing details in advance only to find that they are not quite up to scratch is just not good enough. How can you be sure that these reviews of papers without publicly available data are not good enough until the papers are finally published? “About the process leading up to peer review and publishing of a scientific paper … there has got to be a better way to have these papers properly audited! The difference between Gergis and Watts is, of course, that Gergis passed peer review. If Gergis and Watts had not been reviewed on these blogs it would appear that Gergis would have been published and Watts efforts shut down in any peer review that was even half heartedily adversial as one would have expected. In addition based on the blog analyses, Gergis raises many more questions than merely the obvious error made. The more light that you can shine on any process the better. That mistakes are found is not a weakness in the process but rather a strength. Thinking people are not going to be deterred because we find people are fallible- they already knew that. Yes, obviously. I was referring to the results that I would have plotted (incorrectly) for one observation. I actually cutoff the series so that I had at least 3 observation at any point in time. Mann did a couple of renditions on CO2 fertiliztion and the one I referred to was different I think than the one you are referencing. In my reference there are few explanatory details and much hand waving and Mann was referring to a PC for North American TRW proxies. Would not you have to have some independent evidence of CO2 fertilization effects on TRW or MXD before running the risk of overfitting a model with a variable that has been on a more less upward trend for some time? Or do you depend on a PC analysis to sort this out? In the next day or so I plan to link my bootstrap results for RCS and Spline chronologies using the NotGergis TRW series and not individual NotGergis trees as I did above. Would not you have to have some independent evidence of CO2 fertilization effects on TRW or MXD before running the risk of overfitting a model with a variable that has been on a more less upward trend for some time? The burden of proof is on the Hockey Team to show that TRW and MXD still correlate with temperature after CO2 has been entered. It’s well established biology that trees eat CO2 for breakfast, lunch and dinner. An 8/2/12 article in Nature by Ballantyne et al shows that about half of human CO2 emissions have been taken up by the environment. Part of this is the oceans, but much of it is land — soils, kudzu, and TRW. But if TRs are not included in the reconstruction, there is no reason to include CO2, since there is no reason to believe it affects the other proxies. In the link below I show the bootstrap results using an RCS and Spline chronology on the Australasia TRW series that I have termed Not Gergis in the posts above. While the chronologies give different results it is readily apparent that the wide CIs in both chronologies would not allow for conclusions on significant trends within the data. I also show the map of Australasia as defined in Gergis (2012) and the locations of the 23 TRW series for Not Gergis ( I combined some TRW series that were from the same location) and the locations of the 12 TRW series used in Gergis. You might ask me how I could suppose that TRW series that clustered could be expected to represent the larger map area of Australasia and I would have to refer you to Gergis et al. Kenneth, Appreciate the work you’ve described. Given the weighting of non-Gergis to New Zealand, might I ask which temperatures were used for calibration? IIRC, there is a Court case in progress in which the validity of the early temperature series is being questioned. What is the traditional way for the reviewers of papers to cope with “not sure which numbers to use until the Court gives a decision”? Surely a peer review should pause if related matters are sub judice? “Gergis and Watts”. Now that’s a paper I’d like to see. Can someone advise me (as a non-science lurker) what’s a reasonable time to wait for Karoly and Gergis to go public with their revised findings? re-runing all the code with the detrending corrected shouldn’t take more than a week. Then rewriting the paper by plugging in the “new results” shouldn’t take more than another week. Maybe a third week for co-authors to check that everything is ok. Apparently, somewhere along that path they ran into “problems”, and chose not to follow it, so nobody can give any meaningful guestimate how long it is going to take now. 😉 Personally, I can’t see any way out such that the revised paper is internally coherent and the new “results” are not weirdly in odds with the original “results”. But I’ve been surprised by creativeness of the Team before, so I would not bet on it. Ah yes. Life’s tough when you’re a climate scientist and the dang numbers won’t run as they ought to. Thanks Jean S – and is this the famous one who spotted the “issue” in the first place? If so, I bow. Something that has not been made public, or at least that I have been able to determine, is how Gergis et al were able to obtain the final chronologies from the raw TRW series they used in their reconstruction. They reported using an iterative signal free method based on the RCS chronology and developed by Melvin and Briffa. I am in the process of obtaining that method from Melvin but have not to date. Probably time for a reminder. I did send a reminder to Melvin, who had told me in an earlier email that he could send me the code he used to construct the iterative method used in the Gergis paper, over a week ago and I have not had a reply. 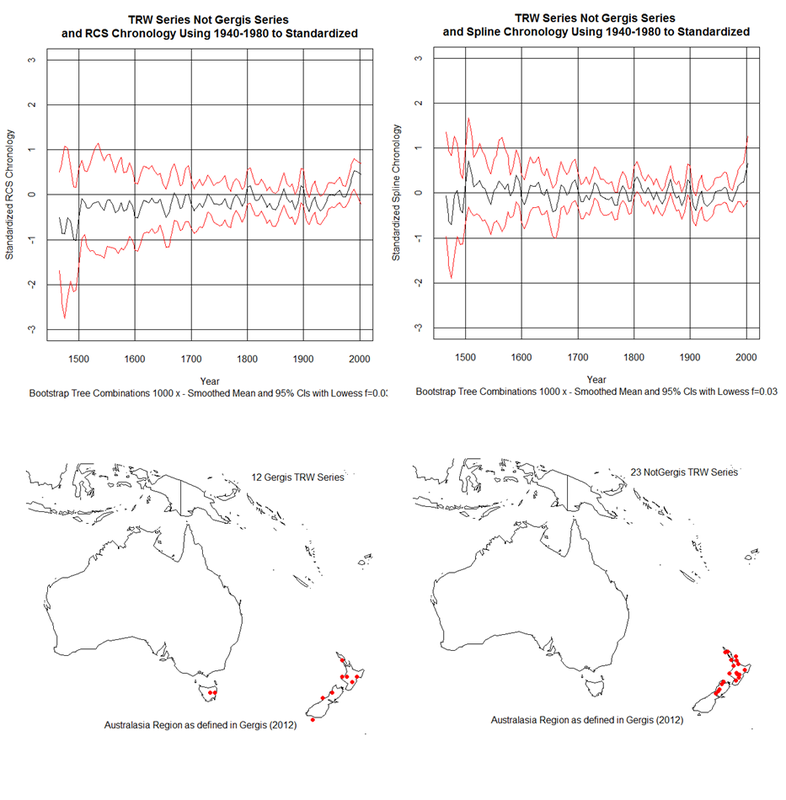 My curiosity about this issue was heightened when I attempted to find tree ring proxies from the Australasia area and listed in the NOAA repository that would match what was published in the Gergis 2012 submission. I used the commonly applied chronology methods and failed to match the Gergis results including the CIs. While much of the conversation here has concentrated on misapplied selection criteria of (not) detrended correlation of proxy response to temperature, there a number of rather unique methods used in the Gergis 2012 submission that need closer and more detailed analyses, which in addition to the uncoded chronology used and the lack of sourcing the data for those proxies rejected by the selection criteria, include such items as the clustering of TRW proxies in New Zealand; the use of proxies located outside the Australasia boundaries that were specified by the authors of the Gergis 2012 submission, the lack of longer coral proxies, with the exception of the discontinuous Palmyra proxy which is far out of the Australasia boundaries; the errors in the table used to denote proxy locations where + and – designations to indicate north/south and east/west locations were ignored; the use of a rather poorly understood reconstruction method of an ensemble PCR reconstruction which gives, in my opinion, unbelievably high correlation between the reconstruction result and instrumental temperatures; and of course, the improper use of a selection process that is based on the fit between proxy response and temperature. The submitted paper indicated that the effort was partially in fulfillment of an obligation to the AR5 IPCC to provide a temperature reconstruction of the Australasia area with smaller CIs than were previously published in previous IPCC reviews. The obvious error of not detrending the data as thought was accomplished is symptomatic of a rush to publish and presents the distinct possibility of the authors not finding other errors or weaknesses in the methods used. Given reasons (due in no little measure by the attention attracted by these blogs analyses and the possibility of further attention to what the revised paper might have to offer) to look more in depth at the methodology and its application in the submitted paper, the authors may well have found and acknowledge amongst themselves problems in addition to not detrending. I had not seen reference to this article anywhere (don’t know if I missed it). Back around June 15 Karoly apparently claimed that (1) data for Gergis et al (2012) was in a public archive, and that (2) the co-authors had not seen Climate Audit discussions before finding the problem independently. I find David Karoly to be lacking in credibility on a variety of matters. p.s. It is paywalled, but I was able to access entire text of article simply searching on Gergis and Karoly. the first bolded sentence is technically correct. “The data actually used” (i.e., incorrectly screened proxies) were publicly archived. That’s why it was possible to check the correlations for those proxies, and to see that there was no way those could have survived the screening as described in the paper. Most of proxies (i.e., those “screened out”) have not been archived, and those were the ones Steve was requesting. Thanks for the clarification. I had meant to highlight how the reporter was given the (false) impression that the co-authors were highly cooperative with providing all of the relevant data, but of course I did not state that clearly/correctly in my comment. Gergis/Karoly update: The prior update on Gergis et al (2012) at the top of the this Climate Audit post (projecting a revised paper by end of Sept. 2012) seems to have disappeared from the Univ. of Melbourne site! It seems this page is hanging loose unnoticed and without updates, since it lacks the “end of Sept.” update and has not (yet) been removed. Watch to see what may happen now that this issue has been noted here on Climate Audit. p.s. I suppose it’s possible the paper has been re-submitted or will be re-submitted, and they are simply removing the PR until they have something definite to say about its status after new peer review. Perhaps we cannot know anything in particular from the (apparent) removal of this PR, but it does seem bizarre how this paper has been handled. For a paper that was so heavily hyped in May as “published” and historic for up to half the globe, to now have no current accurate info (that I could find) on the Univ. of Melbourne site, is worse than peculiar. This paper was supposed to be “the” official IPCC paleo record for the Australasian region in AR5. Gergis, J., R. Neukom, A. J. E. Gallant, S. J. Phipps, D. J. Karoly and PAGES Aus2k Project Members, Evidence of unusual late 20th century warming from an Australasian temperature reconstruction spanning the last millennium, Journal of Climate, submitted. This page is maintained by Steven J Phipps. Last updated 8 September 2012. So it seems that Gergis et al (2012) may indeed be revised and back in play?? hmmmm, sorry, the search link with the result of a cached page on Sept. 5, 2012 does not seem to work as a link…. but there was a Sept. 5 page I found with the Phipps list of pubs which goes only up to  and does not show the  and  items which are at my first link above…. Phipps, S. J., H. V. McGregor, J. Gergis, A. J. E. Gallant, R. Neukom, S. Stevenson, D. Ackerley, J. R. Brown, M. J. Fischer and T. D. van Ommen, Paleoclimate data-model comparison and the role of climate forcings over the past 1500 years, Journal of Climate, in revision. The manuscript “Evidence of unusual late 20th century warming from an Australasian temperature reconstruction spanning the last millennium” by Joelle Gergis, Raphael Neukom, Ailie Gallant, Steven Phipps and David Karoly, was re-submitted to the Journal of Climate and is being reviewed again. Due to errors discovered in this paper during the publication process, it was withdrawn by the authors prior to being published in final form. No mention of your contribution to error discovery Jean? Blow me down. well, you could also say that my contribution was mentioned as many times as Anthony Watts has mentioned it. Ha, I was just trying to put today’s record straight then I saw this. I think this is already hilarious: Anthony managed to write yet-another-post on the issue without mentioning my name 🙂 I have to wonder what I’ve done to piss him off. Steve: I see that this is resolved. I can’t imagine that Anthony would make an intentional slight to you. Jean, in fact Anthony has mentioned your name, with the usual mistake, “kudos to her”. S. Geiger – It’s apparent that use of a corrected procedure does not yield a hockey stick. Well, now I see that it has been re-submitted but Jean makes the caveat that it will not make it into the 5AR. Will be interesting to see if/how their conclusions were affected. At the U. of Melbourne PR site it now says the study has been re-submitted to Journal of Climate for new review. So it seems that they had to formally withdraw the previous version and then re-submit a revised MS? So is the new manuscript formally a new paper, or a resubmitted version of the old one (with changed method, data, text and findings)? 1. Will Gergis, Karoly and co credit Jean S and Climate Audit for finding the errors? 2. Will the paper be included in AR5? 3. Is the reconstruction now more or less like a hockey stick? 4. Are the stats and the data kosher? The when is a door not a door aspects bother me not. It may also depend on whether the people concerned have an ounce of integrity. I remain uninterested in the pettifoggery from which a fig-leaf may attempted in its absence. I have recently received an email from Tom Melvin where he wrote: “I looked at the web discussion on of the Gergis paper. I have never contacted Gergis and it seems extremely unlikely that their chronologies were produced using my program. The “withdrawn” paper does not provide sufficient description of chronology production methods to replicate that work. Based on Dr. Melvin’s reply, I will have to continue to ponder how the tree ring proxies in the withdrawn Gergis paper were processed. I was not able to duplicate or even approximate there results using all the available tree ring data from the Australasian area and with the commonly applied chronologies. I would hope that the reviewers of the new version of that paper require that their methods dealing with tree ring proxies are provided such that the work can be duplicated. The 2008 reference from the withdrawn Gergis paper is linked below and describes the method I had asked Dr. Melvin to provide and the one to which he replied above. The mystery in attempting to track down what was actually used by Gergis in the withdrawn paper continues. By the way, there are other issues with the withdrawn Gergis paper – such as why they defined a geographical area of interest and then went outside that area to obtain some high leverage proxies.